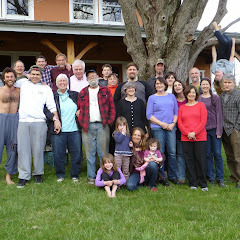 News of activities and individuals in the Quaker Intentional Village in Canaan, New York. Day 1 (Sunday) on the job here in Dhaka went well. In the morning, I met up with my audit partner Soledad (called Sol) at breakfast. She is a Venezuelan Brit who lives in Brooklyn and is proving to be easy to work with and well organized. The WV director joined us at 8 a.m. and gave us a welcome packet that included a security and cultural briefing, which I appreciated. We heard a bit from him on the history of their work here in Bangladesh over the past 38 years. He is Bangladeshi and joined the organization in 1978. We talked about logistics, including whether Sol and I wanted to join the staff for devotions, which they hold every morning from 9-9:30 a.m. We were noncommittal in our responses. Shortly, though, we rounded the corner and it was much quieter. This is an enclave with embassies, expatriate housing, and an international school – it is protected by guards in booths at every entrance. After a few blocks we arrived at a lake along which ran a narrow park with a nice walkway. We scoped it out and saw enough women around that we decided it was safe going. We did most of our walking along the lake, which was very pleasant, then returned to the hotel – sweaty but happy. Day 2 on the job went according to plan. We were joined by Tarikul, our translator, who is a Bangladeshi social compliance auditor in training and whose help we will need out at the project sites. (In the Dhaka office, all the professionals speak excellent English, though some of the accents require a great deal of concentration on my part.) The WV driver picked up the three of us from the hotel and off we went through the crowded streets. The traffic situation is less chaotic than when I was last here about 11 years ago, improved by the banning of bicycle- and foot-powered rickshaws on certain streets. On one such street, I saw a police officer chastising a bicycle rickshaw driver by hitting the rickshaw’s tires hard with a long stick. Quite curious. Sol is the lead auditor, which means she took the lead today during the opening meeting and subsequent interviews we held with staff in all the different departments. We learned about how they are organized, what procedures they use, and how their programs are structured. We reviewed a wide range of additional documentation and got a demo of their financial management system. We checked whether they are in compliance with the official standards against which we conduct the audit. For example, is the organization properly registered in the country? Does each employee complete and sign a conflict-of-interest form upon hire? Are U.S. sponsors’ addresses kept confidential? Is there credible evidence of the positive impact the organization is having, for example in reducing infant mortality rates? Tomorrow we’re off to see urban projects and the people they are benefiting. I had to stop on the way back to the hotel and have Tarikul help me buy a $3 scarf in the market, as I forgot to bring one with me. I think I’m ready now. QIVC, established in 2000, is a community of 30 people of all ages living close to the land on 135 acres of forest and pasture in the upper Hudson Valley. We strive to live spirit-focused lives that are simple, sustainable, and joyful, benefitting from and enjoying our close connections with each other and the land. We welcome diversity of all sorts, and don't all need to identify as Quaker.